Provides methods for fast computation of running sample statistics for time series. These include: (1) mean, (2) standard deviation, and (3) variance over a fixed-length window of time-series, (4) correlation, (5) covariance, and (6) Euclidean distance (L2 norm) between short-time pattern and time-series. Implemented methods utilize Convolution Theorem to compute convolutions via Fast Fourier Transform (FFT). Package website is located here. We use rbenchmark to measure elapsed time of RunningCov execution, for different lengths of time-series x and fixed length of the shorter pattern y. 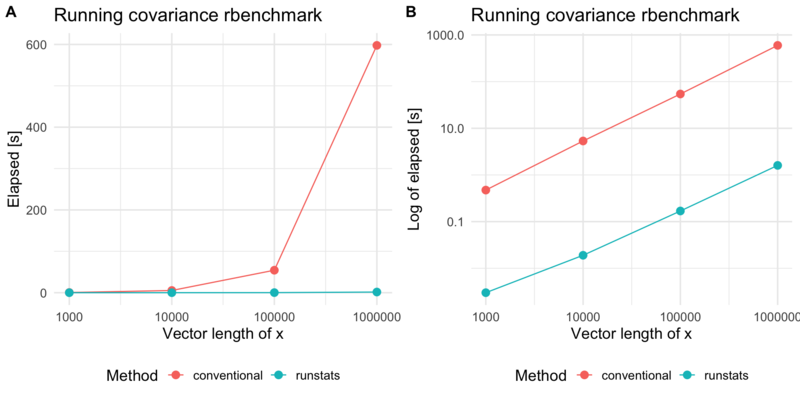 To compare RunStats performance with "conventional" loop-based way of computing running covariance in R, we use rbenchmark package to measure elapsed time of RunStats::RunningCov and running covariance implemented with sapply loop, for different lengths of time-series x and fixed length of the shorter time-series y.